Catla is a fast growing breed of Fishes, It is main species of Ganges riverine coast's. It's prevalence in India upto Godavari, Krishna And Kaveri rivers of Andhra Pradesh. It is known as Catla in Asam, Bengal, Bihar, Uttar Pradesh, Madhya Pradesh, as Bhakhur in Odisha, as Tharla in Punjab, as Beecha in Andhra Pradesh and as Thotha in Chennai in India. It have heavy body, It's head is raised upward, more bulge on back than belly, head is large, mouth is wide and curved upward, upper side of body is grey in color and lateral side of body and belly is golden and silver and the color of fins is black. It mainly takes its food from the surface of water. The Plankton are its main food. 10 mm of size Catla (Fry) eats only Unicellular, algae, Protozoa and Rotifers, and the Fri of 10 to 16.5 mm of size mainly eats Plankton but the Larva of insects, micro algae, and small pieces of rotten grass and plants are also occasionally includes in its food. Length – 1.8 Meter and the weight – 60 Kgs. The female fish starts to get mature from March and the male from April and become fully mature in the June. It breeds in natural riverine environment. Its main breeding period is Rainy season. Its eggs fertility is 80000 to 150000 eggs per kilogram. In general the Catla fish has a capacity to lay eggs 125000 per kilogram. The eggs of Catla fish are of spherical in shape, light red colored transparent and approximately 2 to 2.5 mm of diameter which becomes 4.4 to 5 mm after fertilization and upon hatching the length of a hatchling is become 4 to 5 mm in length and it is transparent. 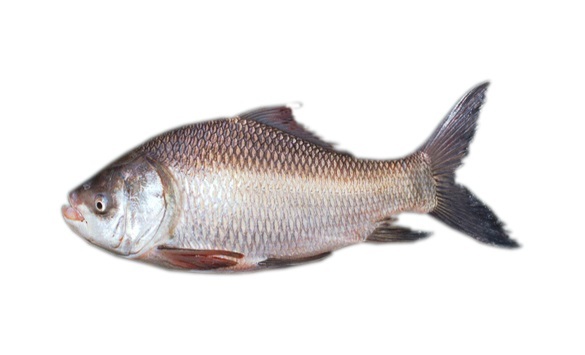 Catla is the fast growing fish among all the major Indian species of fishes. It has a significant place in intensive aquaculture. And It is suitable to be reared in reservoirs and small pond of the State. It becomes 1 to 1.5 Kg of weight after 1 year of rearing. It is very tasty for eating and sold on high rates in the market.